This Sunday I wanted to use up a lot of random ingredients I had around and make something “fancy” yet simple. So I opted for turkey meatballs. Now it’s important to point out that I’m very loosely using the term “fancy” here because what many might consider fancy some might consider random as heck. To me…in this case…both are accurate. 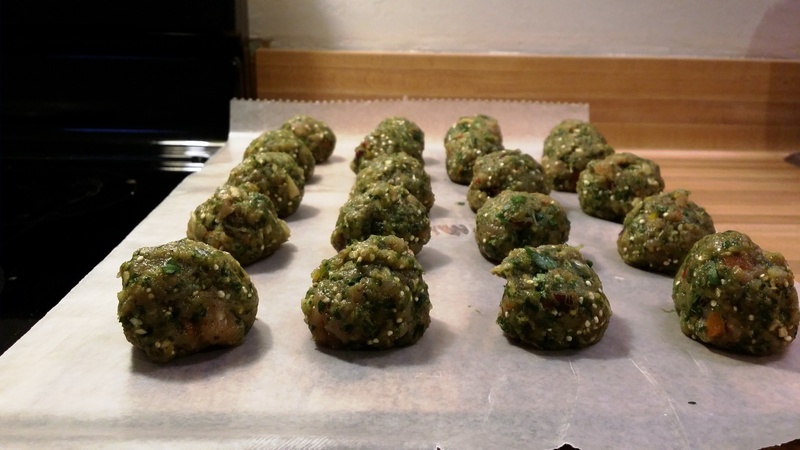 I wanted to try making meatballs but I wanted them to have a lot of flavor. I also wanted to do more than patty up some meat and throw it in a skillet. I was needing to gain a sense of power on Sunday too so I busted out the food processor. Kitchen appliances to cooks are what power tools are to DIY’ers and builders. Plug it in, put it to use, and voila! Instant badassness. Lean ground turkey provides a lot of protein without being high in calories, fat, and sodium. If you’ve eaten lean ground turkey before you know it can be a little underwhelming when it comes to flavor. These badboys are extremely healthy and pack a real punch of flavor. Another important note is that they reheat really well…also a challenge with lean ground turkey. Now some of you are looking at the ingredient list and saying….”do I really need to put quinoa in there?” Well…yes…because I said so. Give it a try…it helps bind the meatballs and hold in moisture. This is definitely a “clean eat’ style recipe so if you have the opportunity and the budget stick with organic ingredients. The meatballs are great by themselves but pair extremely well with a marinara sauce or a sweet potato puree. I recommend serving them alongside a hearty green like asparagus or roasted Brussels sprouts. Today I had my leftover meatballs on top of a salad with avocado and they were quite tasty there as well. I hope you enjoy making as much as I did and I especially hope you love the flavor as much as I do. It’s nice to eat a delicious meal and not feel guilty about it after. This is one of those! 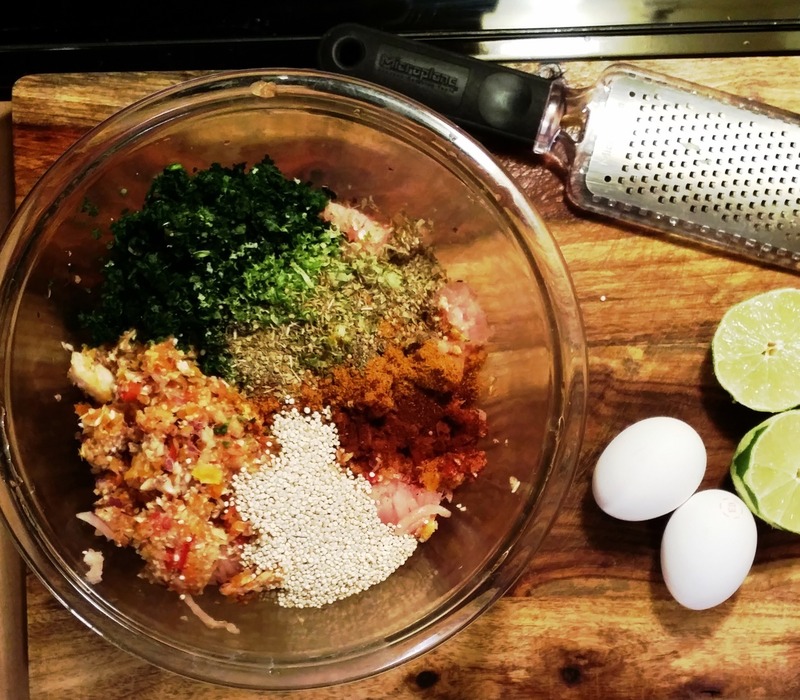 Add the ground turkey and dry ingredients (quinoa, curry powder, chili powder, Mrs Dash, cayenne pepper, black pepper, lime zest) to a large mixing bowl. Add 2 egg whites and set mixing bowl aside. Take the rest of the ingredients and finely chop in a Food Processor (or you can go old school with cutting board and knife but it’ll take you some time). Add this mixture from your food processor to the large mixing bowl and combine all ingredients together using a spoon or your hands. Substitution Notes: Since there are so many ingredients, the egg whites are in place to act as a binding agent. 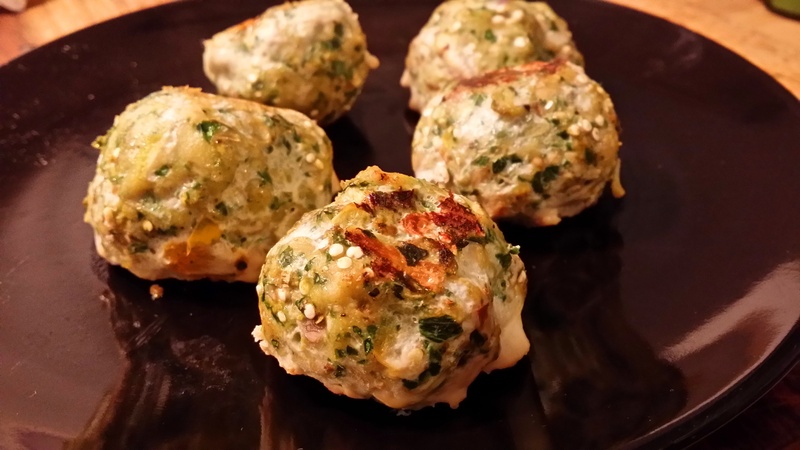 If you want to skip the egg whites give it a shot without them and see if the meatballs maintain their shape. If they fall apart you’ll want to retry the recipe with one of the many suggested substitutes a quick Google search has to offer. Fresh herbs are always preferred in just about any recipe as they have a much more robust flavor and smell amazing when you’re prepping and cooking. Dried herbs will work just fine too though. Can’t wait to try these. Love the ingredients. sounds wonderful. Can’t wait to try.